Season 1, 2012 Summer of the Aliens | Blakyak Community Theatre co. This is a Blak Yak production in association with KADS. Summer of the aliens is semi-autobiographical written in the 1990s. The play is an often humorous, unsentimental coming-of-age story about a 14 year old boy, Lewis, who is obsessed with flying saucers, UFO abductions and imagines aliens are invading the earth. It is 1962 and the world is worrying about the Cuban missile crisis. Meanwhile Lewis, a youth on the cusp of manhood living in a Melbourne housing commission, is preoccupied by flying saucers. His best friend Brian is obsessed with losing his virginity and local tomboy Dulcie is confused about approaching womanhood. From the writer of Cosi, Radiance and The Golden Age, Summer of the Aliens is a coming-of-age story that explores the heartbreaking discovery of an imperfect world. This is a vivid, amusing and evocative play. 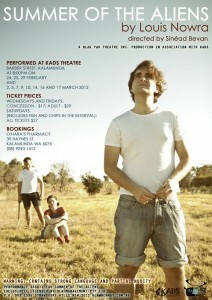 Performances: 24th, 25th, 26th, 29th Feb, 2nd, 3rd, 7th, 9th, 10th, 14th, 16th, 17th March. Start Time 8pm.